Welcome to the Renewable Energy System Parts section of the REUK Renewable Energy Shop. Here you will find a selection of useful and hard to find items relating to DIY alternative energy generation and energy saving. Click on the name of a product to add it to your shopping basket. You will be able to find out more about the product and set the quantity you require when you are there. First class Postage and Packaging on all orders is just £2.45 in the UK. 5 Amp inline fuse holder with one each of 1A, 2.5A, and 5A 20mm fuses. 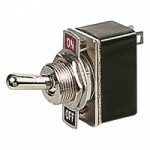 1.5 Amp toggle switch with ON/OFF markings. Very strong and durable.. Complete kit to build your own three phase bridge rectifier – 3 bridge rectifiers, connecting cables and terminal blocks. 30 Amp (400A surge) blocking diode for renewable systems.